Ultimate Fighting Championship (UFC) Bantamweight scrappers Brad Pickett and Marlon Vera will battle this Saturday (March 18, 2017) at UFC Fight Night 107 inside The 02 in London, England. 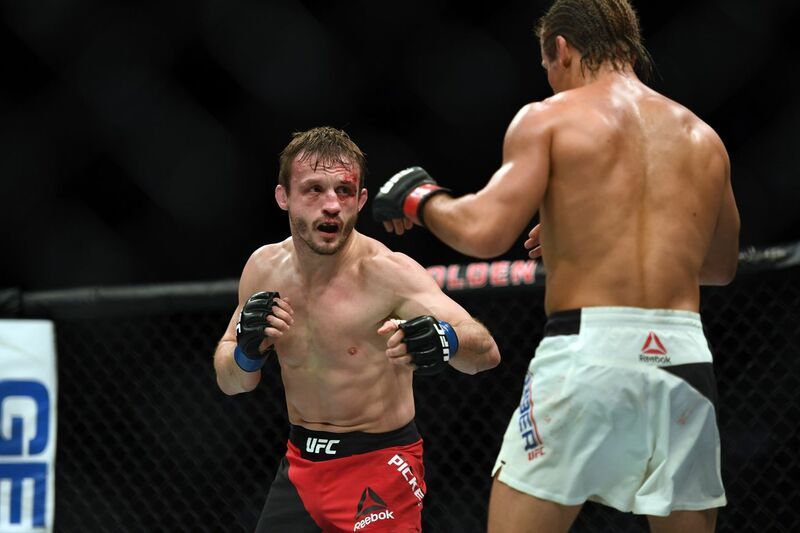 Win or lose, this will be Brad Pickett’s final performance, as “One Punch” has struggled greatly in recent fights. The Englishman has been thinking about retirement for some time, but has waited for an opportunity to do it in front of a London crowd. That almost fell through for him, but thankfully Vera stepped up at the last minute to fill in for an injured foe. The Ecuadorian athlete has split four fights inside the Octagon and could earn a signature win if he ruins Pickett’s farewell fight. Keys to Victory: Despite the nickname, Pickett has always been a grappler first and boxer second at least in terms of actual ability. Pickett can definitely throw combinations from the pocket, but he’s at his best when level changing into double legs and controlling from top position. For the most part, Pickett has struggled with men able to shut down his wrestling ability. Without the threat of the takedown, Pickett’s boxing becomes a bit more predictable, and he’s far easier to counter. Being 38 years old does not help in that regard. Luckily, Vera is coming in on short-notice and is not known to be a fighter with iron clad takedown defense. Instead, he tends to be willing to grapple and scramble with his opponents, which should give Pickett the opportunities needed to gain top position. If Pickett applies a pressure boxing and takedown heavy game plan, he should be able to wear down the short-notice replacement and score the victory. If, however, he tries to slug it out and put on a show in his final performance, he may not escape with the victory. Keys to Victory: Vera is a true scrapper with a dangerous grappling game. Due to the lack of time Vera received to prepare for this match, it’s hard to know what type of shape he’s in, meaning securing an early finish may be a must. For better or worse, Pickett has always been a willing brawler. Vera needs to take advantage of that fact and Pickett’s declining durability by swinging for the fences immediately, as one clean blow could shift the odds into his favor. “Chito” has never been stopped, whereas Pickett was stopped twice in his last four appearances. If Vera can hurt Pickett or even just make him uncomfortable, there’s a good chance that Pickett will shoot. Vera should expect that, and a desperation shot leaves him an opening to counter via strikes or submission. Pickett has a bad habit of being hit often and being forced to work out of bad positions, which is precisely what a young finisher like Vera should look to capitalize on. Bottom Line: It may not be a super important fight for the division, but it’s worth taking note of Pickett’s retirement. Despite the lack of real consequence there’s some definite motivation for Pickett to come out on top. With a win, Pickett scores a memorable end to a great career in front of his home crowd. The London audience will surely go wild for “One Punch,” and there’s no doubt that Pickett would appreciate his win bonus as well. If Pickett loses, it’s not exactly a storybook ending for the veteran, but unfortunately that’s often the case in combat sports. As for Vera, this is a big opportunity. Even on a slide, Pickett’s name still holds some value, particularly as this is a main card appearance for the prospect. If Vera can put on a good show and score a win, he could definitely parlay that victory into another big fight. If not, Vera saved this night for Pickett and the fans without much time to train, which deserves credit on its own. At UFC Fight Night 107, Brad Pickett will look to ride off into the sun set by defeating Marlon Vera. Will Pickett have his hand raised?